What's Next: T-Mobile and Sprint have agreed to merge into a new telecom giant that would rival Verizon and AT&T. The $26-billion deal would give the new T-Mobile more than 100 million subscribers. T-Mobile CEO John Legere would run the company. Masayoshi Son's Softbank, which owned 80% of Sprint, would then own just 27%. What's in the Way: Antitrust regulators, who may view the merger as anticompetitive. Sprint and T-Mobile will make the case that a combined company allows them to create a better 5G network than they could on their own, an argument that could appeal to the Trump White House given its emphasis on 5G as a national security priority. The Big Picture: 5G is leading to a collision between wireless providers, cable companies and tech companies. The new network will underpin everything from home internet service to autonomous vehicles. Scale is crucial. Good morning. Busy week ahead. Today & Tomorrow: The Milken Institute Global Conference: The so-called "Davos of the West" kicks off today in Beverly Hills. Treasury Secretary Steven Mnuchin speaks at Noon. I'll be interviewing Oath CEO Tim Armstrong, NBC Entertainment Chairman Robert Greenblatt and Headspace co-founder Andy Puddicombe, among others. Tomorrow & Wednesday: F8: Facebook's annual developer event in San Jose will have a different feel this year on account of the company's data privacy scandals and its effort to fix public perceptions. Our colleague Heather Kelly will be in attendance. Wednesday & Thursday: Collision: "America's fastest growing tech conference" returns to New Orleans. I'll be moderating a talk with Lyft CEO John Zimmer and an investor roundtable with folks from Khosla, Kleiner Perkins and Harvard Business School. Where we were last night: Opening night at the Gensler-designed Banc of California Stadium for the first-ever LAFC home game, which they won with a dramatic last-minute goal from Laurent Ciman in stoppage time. The LAFC ownership group -- led by Peter Guber, Tom Penn and Henry Nguyen -- absolutely got this one right. The stadium experience was world class. T-Mobile's John Legere says he and Sprint CEO Marcelo Claure spoke to FCC Chairman Ajit Pai and will meet with him in person in Washington. • "T-Mobile US and Sprint are pitching an America First 5G deal. ... T-Mobile US Chief Executive John Legere said the deal would create rural jobs and keep the country ahead of China in the 5G race. That's likely to appeal to President Donald Trump's regulators." • "No matter how much hyperbole Sprint and T-Mobile expend, it is hard to see how the deal will pass muster with regulators. ... Michael Kades, a former lawyer at the F.T.C. ... [says] 'the market concentration is presumptively anticompetitive.'" 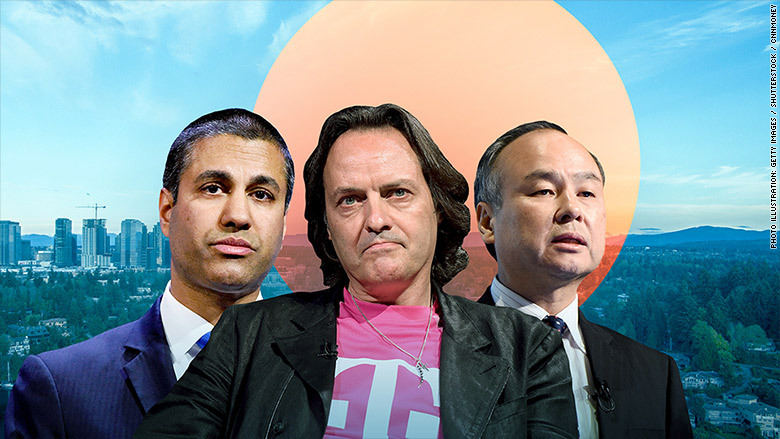 • "Should the deal collapse again ... T-Mobile shareholders can at least take comfort in knowing that ... T-Mobile will always be in play for acquirers wanting a toehold in the wireless space. Sprint, on the other hand, doesn't have much of a fallback plan." This deal might normally be blocked. But the Trump administration's emphasis on 5G, coupled with the president's penchant for unpredictable behavior, makes it hard to anticipate the outcome -- even though it is up to FCC and DOJ. • "Walmart on Monday said it would sell its British arm Asda Group to rival J Sainsbury, a deal that values the chain at about ... $10.1 billion and would, if successful, create the largest player in the U.K.'s fiercely competitive grocery market." • "The move is part of a broader shift by Walmart to form joint ventures in competitive markets and focus investments in areas executives think will provide growth." • Walmart "is also in talks to sell its controlling stake in its Brazilian operations and in advanced discussions to buy a majority stake in Flipkart Group, India's largest e-commerce company." The Big Picture: Amazon-vs.-Walmart war is global. Walmart is struggling to keep pace with Amazon's innovations in delivery and in-home technology, so it is refocusing investments where it sees opportunities for growth. • "In Europe, Amazon.com Remains Out of Fashion" by WSJ's Jeanette Neumann and Laura Stevens. "Online giant has trouble gaining traction in apparel and footwear, a key part of its U.S. dominance." • "One Goal of Amazon's HQ2: Learn the Lessons of Seattle" by NYT's Nick Wingfield. "Amazon has surprised officials in cities vying for the company's new headquarters by asking how to avoid soaring housing costs and paralyzing traffic." • "In Age of Amazon, a Warehouse Powerhouse Is Getting Even Bigger" by Bloomberg's Rob Urban: "E-commerce is reconfiguring supply chains and shaping the fortunes of industrial landlords." Bonus: Bezos talks to Axel Springer. "At Nike, Revolt Led by Women Leads to Exodus of Male Executives" by NYT's Julie Creswell, Kevin Draper and Rachel Abrams: Women inside Nike's headquarters "covertly surveyed their female peers, inquiring whether they had been the victim of sexual harassment and gender discrimination. Their findings set off an upheaval in the executive ranks of the world's largest sports footwear and apparel company." The case of Eric Lundgren, an American who allegedly ran a counterfeit software supply chain in China, is receiving attention after reports from the UK Register and TechCrunch portrayed his case as a mistrial that resulted in an unjust 15-month prison sentence. • "In a sickening concession to bad copyright law and Microsoft's bottom line over basic technical truths and common sense, Eric Lundgren will spend 15 months in prison for selling discs that let people reinstall Windows on licensed machines." • "In 2012 feds seized a shipment of discs, which they determined were counterfeit copies of Windows, heading to the U.S., where they were to be sold to retailers by Lundgren. ... The only problem with that was that these weren't counterfeit copies of Windows, and they were worth almost nothing." • "A federal appeals court this week upheld the sentence handed down in ignorance by a Florida district judge, for a crime the man never committed." • "Microsoft did not bring this case"
• "Lundgren established an elaborate counterfeit supply chain in China"
• "Lundgren failed to stop after being warned ... Lundgren pleaded guilty ... Lundgren went to great lengths to mislead people." The Big Picture: Don't read Coldewey without reading Microsoft; don't read Microsoft without reading Coldewey. It's over ... for now: The mega-merger trial between the U.S. Justice Department and AT&T ends today with the two sides presenting their closing arguments to Judge Richard Leon. • "The government has argued that AT&T viewed the merger as a way to convince viewers to stick with pay TV instead of moving to cheaper online providers." • AT&T & Time Warner said "the ability to create compelling video would allow them to advertise more effectively, giving the merged company a fighting chance to compete with internet advertising titans like Facebook and Google." • "Leon's decision is expected to take 'several weeks.'" Who has the edge? AT&T, per WSJ's Brent Kendall: "Closing arguments ... give the Justice Department a final chance to frame its arguments and AT&T an opportunity to cement its gains." What Burbank is talking about: "Avengers: Infinity War," which opened with $250 million in North America, surpassing "Star Wars: The Force Awakens" for the biggest domestic opening weekend of all time. Variety's Rebecca Rubin: "The superhero tentpole, which cost between $300 million and $400 million, opened worldwide with $630 million, making it the highest global opening weekend of all time, even without China debuting this weekend." What Next: For the Milken set: Eater's Mona Holmes goes inside Avra Beverly Hills, the new high-end Greek restaurant from the folks behind New York's Avra Estiatorio.